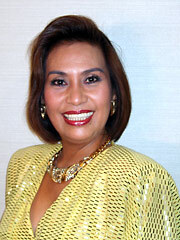 Maria Eva hails from the island of Marinduque, Philippines. She's born to a family of musicians. Her grandfather, father and brothers are all members of a brass band. Her sisters play musical instruments too. Her mother has been very supportive of her singing since she's small. She started singing at a very young age and developed her God- given talent by singing hymns and praises as a soloist in churches. She joined and won singing competitions held in different places. Later, appeared on television programs and heard in different radio stations. Maria Eva came to Japan at the age of 26. She started her career as a singer singing soul and pops music then later on found her niche in jazz music. Her 1st solo concert was held in 1991 at the Theater Sun Mall. The first CD entitled "Maria Eva's Club" was released in the same year. Her powerful voice and profound interpretation of the lyrics endow the songs with special meaning. Maria Eva has firmly established her reputation in the music industry, performing with veteran jazzmen as Yuzuru Sera, George Kawaguchi, Eiji Kitamura, Norio Maeda, among others.